One image was taken at the peak of an era. Another was shot at the start of an era. These two similar photos of the Dallas skyline — taken 20 years apart — reveal some interesting changes to the downtown landscape. By 1931 — when the first photo was taken — the city of Dallas had transitioned from an agricultural center to an urban manufacturing center. During rapid industrialization new towers and palaces had risen for banking, retail and commerce. Dallas had become home to the Eleventh District of the Federal Reserve Bank (lower center), the largest inland cotton market in the U.S. (top left), and the financial center for the oil boom of East Texas. The interurban railway (lower right) extended to many corners of the region, and vibrant neighborhoods surrounded a dense city center. The Great Depression was on its way, but Dallas was well-established as a major city. The affects of the Depression were lessened through a series of building projects (like Dealey Plaza) and Dallas used the Texas Centennial Exposition to showcase itself to the rest of the country. The 1940s made the region a center of major manufacturing for war-related materials and a hub for new government offices. Dallas skyline in 1931 (click for larger). 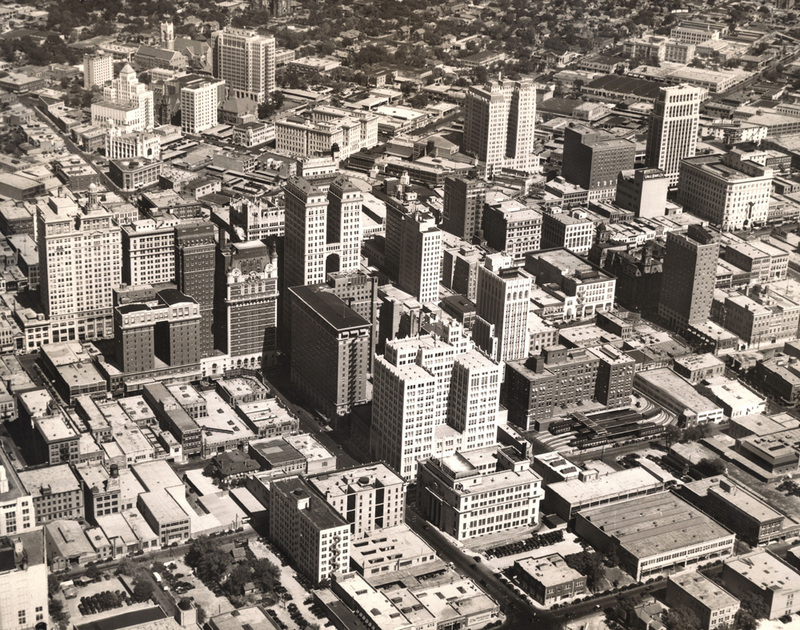 The photo below — taken in 1951 — shows downtown right before modern architecture and major new projects would alter the skyline. The 31-story Mercantile National Bank building (right) had already become the city’s tallest in 1943 — the only major skyscraper built in the United States during World War II. 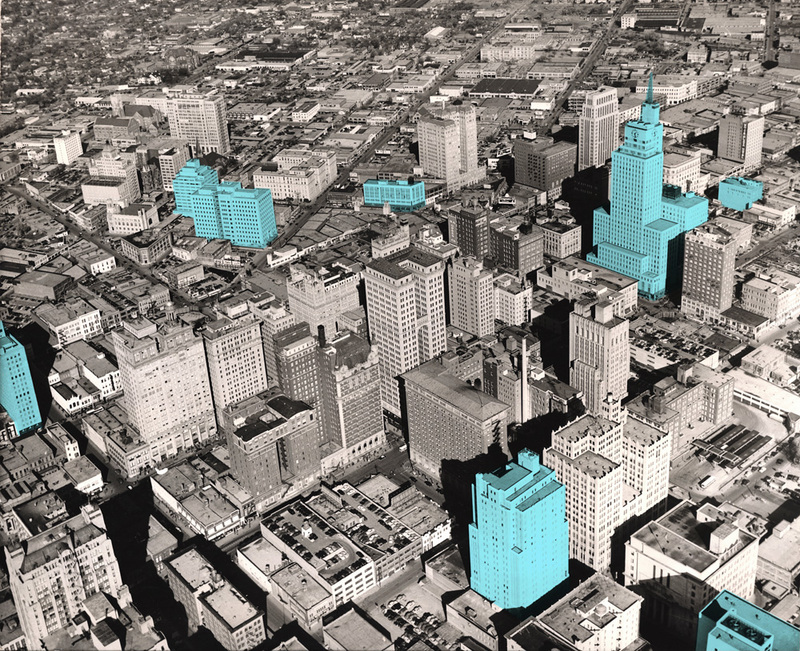 Other major buildings (highlighted in blue) and building expansions added to the city’s density, yet visible changes to the skyline (for a population gain of 173,987 residents) were relatively subtle. The city was preparing for postwar growth and new streets (such as Field, lower left) cut through downtown for easier access, but the commercial center was still relatively compact. Transportation of the past (such as the interurban, replaced by streamlined motor buses) had been abandoned for thoughts of the future; larger parking garages became an urban necessity. Soon after this photo, the unprecedented population growth of the 1950s created a boom in construction. The compact commercial zone would soon expand outward as new areas of downtown were transformed into large developments (such as Southland Center) away from Main Street. Innovative construction techniques would allow rival companies to vie for the title of tallest and most modern. Over decades, older landmarks were demolished for new towers (or in some cases, parking lots), resulting in the the downtown we recognize today. Many of the structures in the photos still remain; dwarfed by the Dallas skyline of today, they tell an interesting story about the evolution of the city. One Response to "Dallas Skyline, 1931 vs. 1951"
Can the 1931 Skyline photo be purchased in an 11×17 size?